Everyone wants to eat great tasting food and smoked food can be some of the absolute best. Of course, grilled food could be some of the absolute best as well. That’s why a grill smoker combo is a great option and with our grill smoker combo reviews, you’re going to have the best of the best all around. There’s no reason to settle after all. Type: What type of option are you getting? Does it use pellets, charcoal, gas? You want to know how it’s going to be powered so you can make sure that it’s going to keep right on running as long as you need to cook your food. Finish: What does the exterior of the grill look like? Is it silver, black, bronze or something else? You want to know what it’s going to look like even if this isn’t really about the overall quality. It’s a personal preference consideration. Cooking Area: How much cooking space are you getting? The more cooking space the more people you’ll be able to feed. It’s going to make things more convenient but you don’t want something too large for your family either. Digital Controls: Are there digital controls or manual controls? Again, this is going to be about your own personal preference but it is something that you’ll want to consider. Make sure you know what you’re actually getting. Size: What is the size of the unit itself? Rather than just the cooking area you want to make sure you know just how large the system is so you can make sure there’s room wherever you’re going to put it. Don’t be surprised by the size. Warranty: What type of warranty are you going to get on the unit? You want something with a good warranty because that says the company is going to stand behind their product and make sure that it’s going to work for you. With so many grill smoker combos out there you need to make sure you’re getting something high quality. That’s why we’ve done the work for you and created these grill and smoker combo reviews. Each one is going to help you decide just what the best choice is when it comes to your next grill and smoker. We’ve done the hard part; it’s time for you to have some fun. 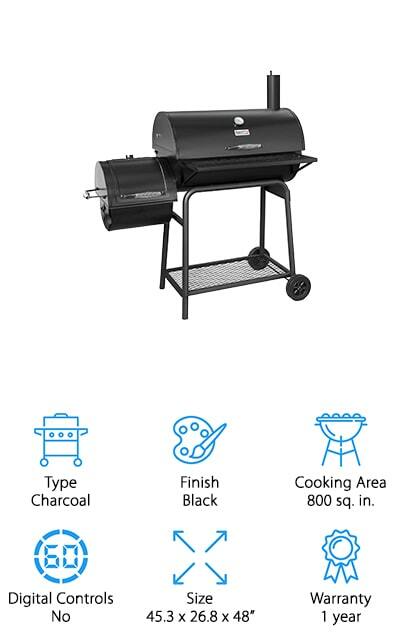 This is our best grill smoker combo for a number of reasons, but mainly it has to do with the fact that you’re going to get a whole lot of great features in one single package. It gives you 646 square inches of cooking space, which is definitely going to be more than enough for your family and possibly even for that next party you want to throw. All you need are wood pellets in your favorite style and you’ll be able to get the smoke that you’re looking for in no time. 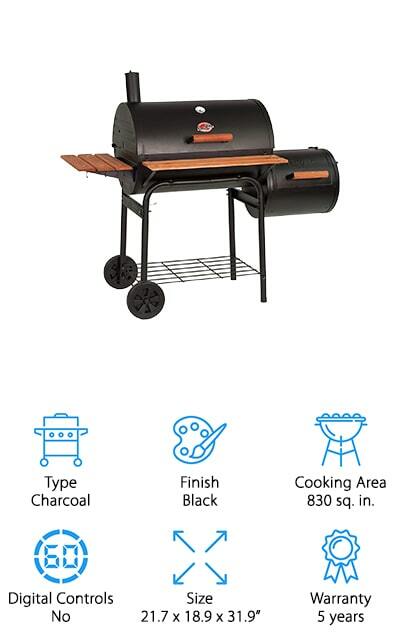 It gives you hot and fast options and low and slow options, with the ability to grill, smoke, bake, roast, braise or bbq your food. The bronze finish on this unit makes it look sleek and the digital controls make it easy to keep the temperature where you want it and make sure that you’re getting the results you expect. All you need to do is figure out where you’re going to keep it. Our budget pick is actually a great way to provide plenty of food for everyone around you in no time at all. It only takes a moment to recognize that 830 square inches of cooking space between the grill and the firebox is going to be great for a big crowd. It has a powder-coated steel build with cast iron cooking grates to ensure your food is heated evenly and the pieces aren’t going to come apart. 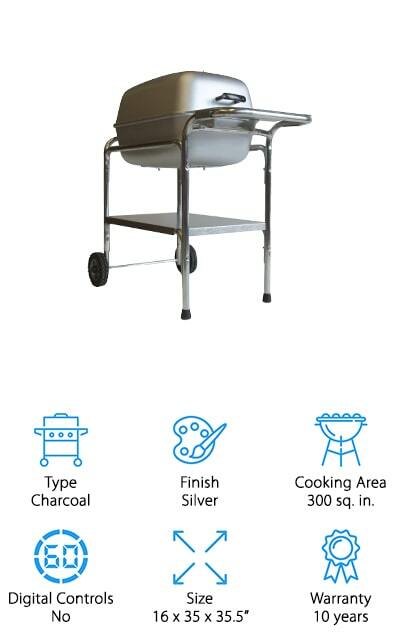 It even has charcoal drawers that make it easy to add new charcoal or take out the ashes quickly and easily. The shelves around the unit make it easier to prep your ingredients and be ready for the next stage in your cooking process. Complete with a temperature gauge and wheels to make it easier to move around, this is definitely still a great option. 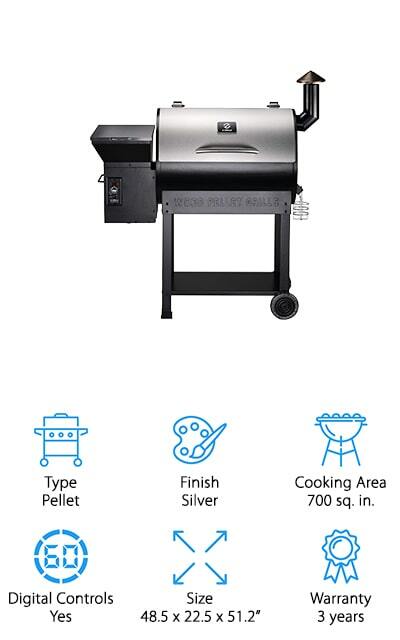 This best combo grill is a great way to go if you’re looking for a high quality pellet grill with plenty of cooking space. It provides you with plenty of options in the way of what pellets you use and also gives you 700 square inches of cooking space, so you can make sure you’re preparing enough for everyone. Complete with digital controls to keep the temperature just where you want it, this grill uses fan forced convection cooking to get rid of your need for a rotisserie while keeping all the options you could possibly need, like grilling, roasting, smoking, baking and braising. 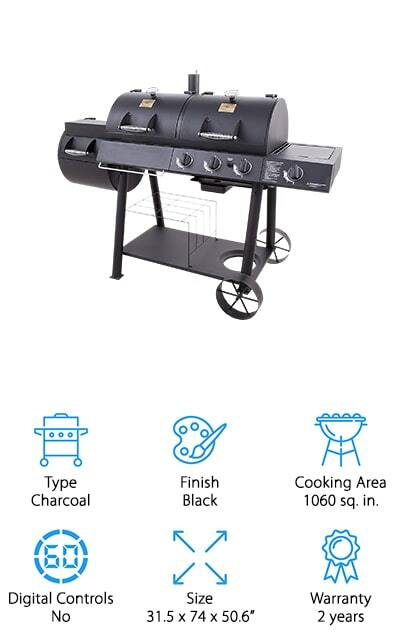 Available in different finishes to match your personal style, this grill even comes with a 3 year warranty that proves it’s definitely going to work great. It has an automated electric feed system and provides constant heat between 180 and 475 degree Fahrenheit for the ideal food for your next dinner or party. Here you’re going to get a smaller unit, but it’s still going to provide you with plenty of opportunities to get a great smoke. Not only that but it comes with a 10-year warranty so you know you’re definitely getting a quality unit. The silver finish makes it look sleek but it also comes in a graphite so you can get the ideal look for your space. You won’t have digital controls here, but you are going to have a unit with 300 square inches of cooking space, enough for your entire family. This portable unit actually detaches easily and can be used as a portable unit as well as a home unit. The entire thing is made out of aluminum to provide a rust-proof and lightweight system that’s also high quality and provides great heat conduction as well. Here’s your bbq grill smoker combo with plenty of everything you’re looking for. It uses pellets in any type you want to get the ideal flavor of smoke and it has a silver finish that looks sleek wherever you put it. The large size makes it great for cooking anything you might want and the 570 square inches of cooking area are definitely enough for the family or for a party. You get grease management as well as a simple ash cleanout system, plus a pellet purge that keeps everything clean and running at the optimum levels all the time. 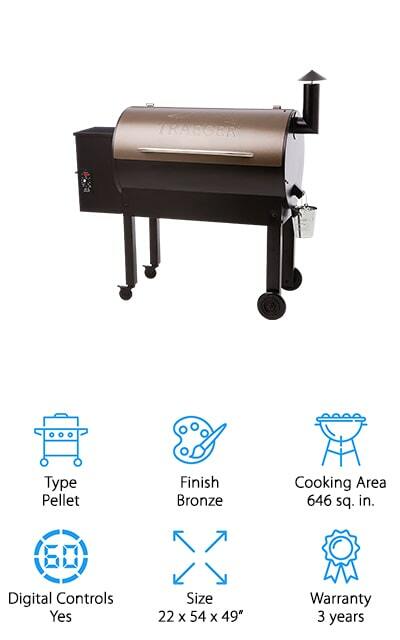 You’re going to have digital controls here that are designed to keep your grill at the optimum temperature no matter what you’re making and you get auto-ignite, a meat temperature probe and a super simple hopper release to get everything emptied back out. Plus the whole thing is on wheels to make it easier to transport. This grill may not look like much but it’s still one of the best grill and smoker combo options out there. 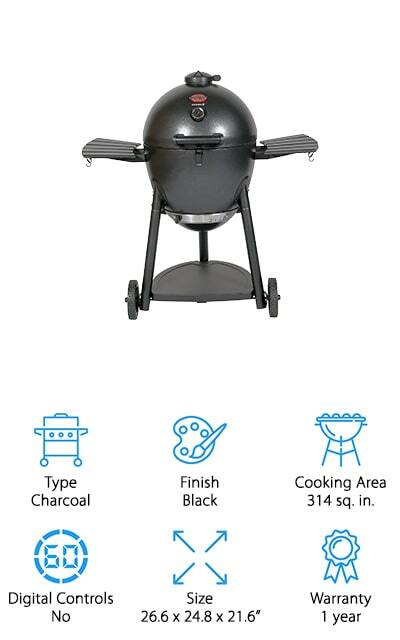 It provides you with a charcoal style grill in a black finish that will look stylish no matter where you put it and also looks much cleaner no matter what you’re cooking. It’s insulated to keep the heat in and make sure you don’t need as much charcoal, plus it has a cast iron cooking surface of 314 square inches. That means you’re going to have a whole lot of space to get everything done. You won’t have digital controls, but you will have a heat gauge and you’ll have an easy dump ash pan to keep everything clean. The tubular steel of the frame means that it’s lighter weight than some options and it has wheels, which make it easier to move around whenever and wherever you might want. There’s a 1-year warranty included to make sure you get high quality. 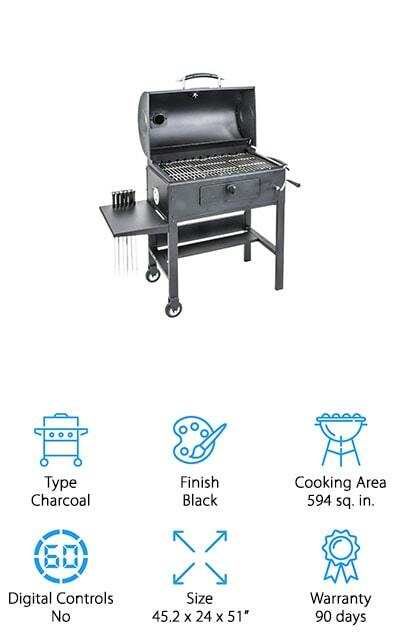 This charcoal grill is black on the outside to keep it looking stylish and it has porcelain steel on the inside and chrome for the warming rack. All of that means it’s not going to rust and it’s going to provide you with the high quality that you’re looking for on everything you cook. There’s a seamless connection between the main chamber and the side of the smoker to make sure that it stays hot at all times and it’s fully sealed to keep the smoke in where you want it. You won’t have digital controls, but you are going to have 800 square inches of cooking area. The charcoal pan is able to hold up to 5 pounds of charcoal at a time so you shouldn’t have to refill it while you’re working. It also comes with a 1-year warranty so you know you’re getting something that you can count on. 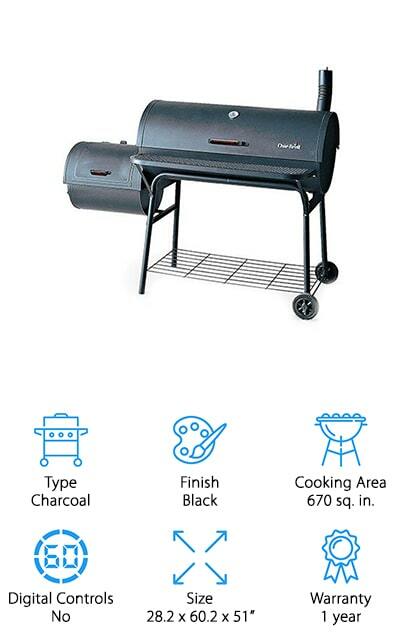 This 3 in 1 smoker is the best smoker grill combo we’ve found for doing smoking, barbeque, and grilling in a small space and with a charcoal design. It’s going to give you 670 square inches of cooking space so you can cook up whatever you may want. 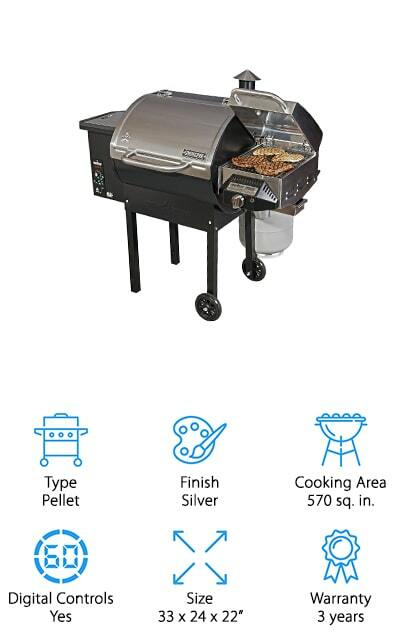 It has a chrome plated handle to make sure that you can open up the grill whenever you want to check on your food without having to worry about burns or other injury and it has adjustable dampers that let you keep control over the amount of heat and the amount of smoke that you’re getting inside. You’re not going to have digital controls, but you are going to have a 1-year warranty. The storage rack makes sure you have space for any tools you may need as well as any extra charcoal that you might want. Not only that but this unit has wheels to make it a whole lot easier to move and a shelf in the front that holds anything else you need. Here you’re really getting the best of the best because you’re going to have over 1000 square inches of cooking space to work with. This charcoal grill combo is finished in black for a sleek design and offers you plenty of space for everything you might want. It has three different sections and 6 different grates so you can keep things where you want. You also get 3 12,000 BTU burners in the grilling chamber and a 12,000 BTU side burner that you can hook up with a charcoal chimney. The porcelain coated, cast iron grates are going to provide even cooking without you having to worry about things like rust or debris. They’re going to keep your food tasting great and with the 2-year warranty, you know that it’s going to last. If you want a grill that gives you options from barbeque to kebob cooking then this is the way to go. It has adjustable vets that provide for just the right amount of heat and smoke and it has a built-in thermometer that will let you know what the temperature is on the inside no matter what. You get a powder coated finish in black that’s made to stand up to the high temperatures you need as well as anything else that might be happening outside. You’ll have 11 custom skewers as well as a rotisserie motor to make sure you get an even cook and a great flavor on all of your kebobs, plus you’re going to have plenty of space for anything else you might want to cook with the 594 square inches of cooking space and the 90 day warranty.